In 1910 the first Official Handbook for Boy Scouts was published. Its full title was A Handbook of Woodcraft, Scouting and Life-craft, which gives an indication of how useful it could be for survivalist. The author and man behind the scouting movement, Lord Baden-Powell, was someone who knew at first hand about survival and its importance. He was a veteran soldier who’d served in the Boer war and written about reconnaissance and scouting. The handbook was preceded by his text Scouting for Boys, which he began publishing in 1908. 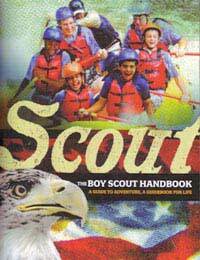 Through the years the Boy Scout Handbook has gone through many editions, and there have been additions and subtractions to the text. As of 2009 there had been a total of 12 editions. Those interested in survival won’t bother with the sections about what it means to be a boy scout, or be interested in the idea of scouting in chivalry. It’s what’s in the rest that’s the real meat and potatoes. There are two sections of useful information in the Handbook – woodcraft and campcraft. They form a very good primer for anyone interested in outdoor survival. The beauty of it all is that it’s explained very simply – remember, it’s aimed at boys of 11 and up (and girls, too, these days). It’s the ideal reference book for all the basic skills you need to survive, and it should be the very first volume on any survivalist’s bookshelf. Read it, commit everything to memory and you have a great leap on others in the survival stakes. Most people associate scouting with learning all manner of knots, and it’s true that knowing them is part of scouting. But there’s a great deal to be said for that knowledge, it can be eminently useful. The same is true for making a fire, reading a map and using a compass, or figuring out whether a site is good for sleeping. These are skills that people pay hundreds of pounds to learn on survival courses, and things that scouts take in as part of their training. More than that, the handbook teaches about the woods, about plants and ecology, and gives respect for the natural world, which is also a facet of survivalism. It might seem hard to believe at this remove, but the scouting movement was originally intended to teach all these survival skills to boys. These include physical fitness – and unless you’re fit, you won’t survive too long. Add to that some of the basics of first aid and you have a manual that could quite easily be called The Survivalist’s Handbook. It covers every aspect that’s likely to concern you and imparts its information in a very simple, straightforward manner. For this, how you feel about scouting as a movement is irrelevant (although reading the Handbook will likely increase your respect for it). Think of it as a compendium of useful information. Read it, learn from it, and practise everything in it. It will give you exactly the grounding you need in order to survive in the outdoors, including how to use the tools you take along. Follow what it says and you can save a small fortune on survival classes.